This price drop is effective in the USA only. Pricing outside the US will vary by dealer and region. If you’ve been considering a digital mixer but haven’t checked in on StudioLive for a while, it’s worth mentioning that the entire StudioLive line won the Musical Merchandise Review (MMR) Dealer Choice Award for Recording Equipment Line of the Year for 2015. Furthermore, recent firmware updates now allow the StudioLive AI Console Mixers to connect to StudioLive RM- and RML-series rack mixers in Stage Box Mode. And of course, StudioLive AI still offers the always-improving remote iPad control options that helped make them such a hit. All StudioLive mixers also include Studio One 3 Artist, our award-winning digital audio workstation. The StudioLive AI Console Mixers have garnered a lot of praise in the time they’ve been around. Click any of the quotes below to read the full review. Interested in having an award-winning mixer suitable for stage or studio? 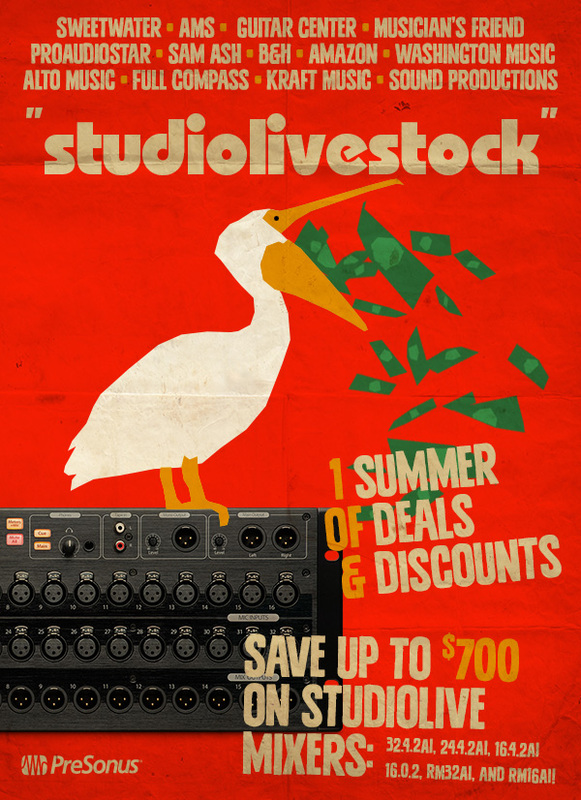 Summer of StudioLiveStock: Save up to $700 on StudioLive Mixers! All summer long (and then some) select dealers in the USA are offering discounts of Kozmic proportions on StudioLive mixers. These deals include savings of up to $700, which is enough to get you and several high school friends into the Guns’n’Roses reunion tour, and almost enough to get you and a friend to Oldchella in October. 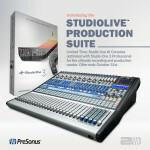 Comments Off on Summer of StudioLiveStock: Save up to $700 on StudioLive Mixers! From August 1 through October 31, 2015, customers who buy any StudioLive AI console mixer will also get automatically upgraded to Studio One 3 Professional. If you’re looking for a professional studio solution (even in your very own home), this is the way to go. StudioLive AI Mixers make a great choice for studio production work for 3 reasons: great sound, flexibility, and software integration. Dedicated Fat Channels and effects processing processing for getting a great sound while tracking (with no latency). The StudioLive AI mixers and Studio One 3 play very nicely together. In fact, any settings you make in the StudioLive’s Fat Channel during recording are non-destructive—these settings can be imported into your Studio One session for additional tweaking during your mix process. Furthermore, StudioOne includes template configurations for all of our mixers and interfaces, so once you’ve connected the StudioLive to your computer and fired up Studio One, you’ve only got to make about two clicks before you’re recording. Smart stuff! With all the additional effects, instruments, editing and Sound Design capabilities (like parallel processing FX chains) that come with the auto upgrade to Studio One 3 Professional. The StudioLive Production Suite is the ultimate solution for your recording studio (while still an incredible solution for live sound production and recording). This offer is available worldwide. 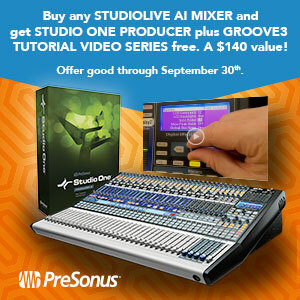 Just get yourself a StudioLive AI before October 31 2015, and you’ll receive a download link for Studio One 3 Professional in your my.presonus.com account when you register your mixer. To find a PreSonus dealer in the USA. 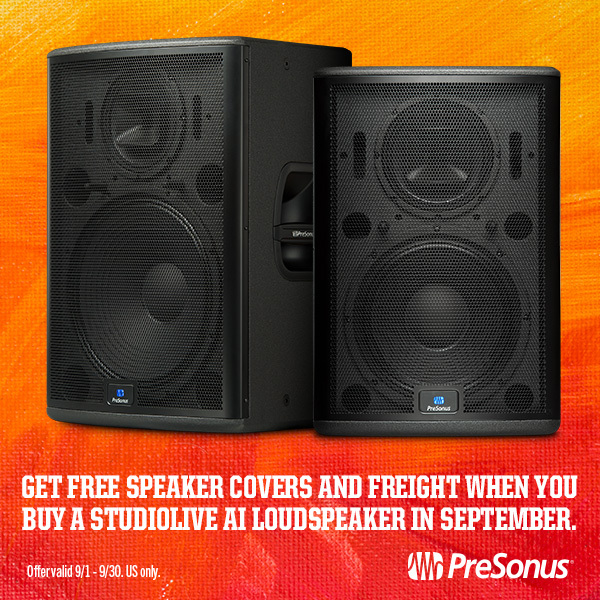 To find a PreSonus distributor outside the USA. 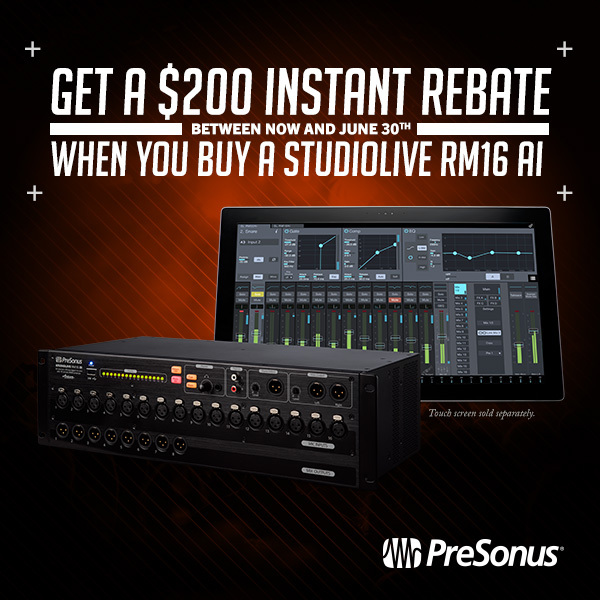 Until June 30, we’re offering $200 the purchase of the StudioLive RM16AI in the USA. No rebate forms, no mail-in anything, just money in your wallet. 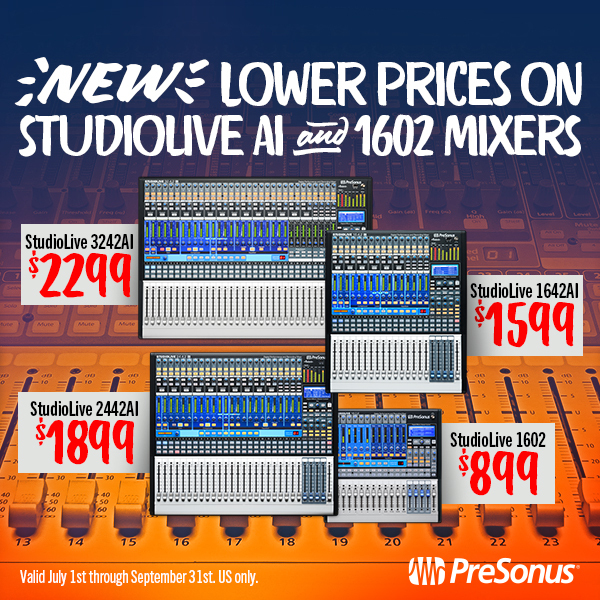 This is a similar offer to the $300-500 off we’re offering on the StudioLive AI Console mixers, which you can learn more about by clicking here. Of course, since there’s no faders, you also get UC Surface control software (for Mac, Windows, and iPad), Capture 2, QMix AI, and Studio One Artist. The mixer additionaly features monstrous onboard Fat Channel DSP, Wi-Fi and wired networking—plus built-in AVB. It’s a real powerhouse, despite an inability to adhere to long-established conventions of nomenclature. Click here to learn more about all that good stuff. But perhaps coolest of ALL, and why this is such a good deal right now—the RM16AI is designed to be elegantly controlled by the StudioLive CS18AI moving fader Ethernet/AVB Control Surface, allowing complete hardware control of all mixer features. Oh, and the StudioLive RM16AI is also one of Mix Magazine’s “Most Innovative Products of 2014.” We’re flattered and thankful for the recognition. David Gibbs is the Executive Director of The Blue Devils, the best drum and bugle corp in the world. They’ve come to rely on the StudioLive AI digital mixers as well as the StudioLive AI PA Loudspeakers. In one of the best PreSonus LIVE episodes ever, Justin Spence and Wesley Smith take user questions about the latest firmware update for the StudioLive AI Mixers, which added the cascading feature. Cascade any StudioLive AI Mixer to any other StudioLive AI Mixer and boost your mixing power! Get the firmware update by logging into your account at my.presonus.com. For more on the StudioLive AI Mixers, click here.